Enacomm processes more than 1,000,000 voice calls, SMS texts, emails and automated data transactions every day. Focused on the prepaid industry since 2005, Enacomm is the subject-matter-expert for personalized, multimodal, self-service voice & data solutions. Enacomm provides hosted applications for customer authentication and onboarding, robust reporting & analytics, call center management and advanced CRM. Utilizing web, mobile, SMS texts, email, voice and other communication technology channels, Enacomm helps organizations provide customers with a superior, multi-modal self-service experience. Organizations also benefit by receiving the real time information needed to better manage customers, systems and analytics. Enacomm’s systems and services are flexible and quickly intake, automate and process high volumes of spoken and/or digital requests. Rapidly deployed, these systems and services quickly provide unparalleled, real-time, intelligent customer service to your organization. Delivered as hosted or on-demand services through the cloud, Enacomm’s self-service and assisted-service solutions are helping organizations cut costs, cross-sell, improve loyalty, and increase customer retention. · Eva®, Enacomm Voice Authentication authenticates customers in real-time using voice biometrics. Eva’s voice biometrics is a proven method of identification — perfect for multi-layered authentication systems. · eKBA®, Enacomm Knowledge Based Authentication for mobile account activation and verification (out of wallet authentication). · eAlerts™ allows non-technical users to launch the outbound text, voice or email messaging campaigns your organization needs. · ViA®, a cost-effective, easily-implemented analytics tool for call centers with real-time IVR and CTI reporting, monitoring and alerting. · Engage™, a browser-based console to manage and extend the capabilities of the IVR, unifying interactions across the web, chat, email, fax and voice recognition channels. · ENCART®, Enacomm Network Call Center Routing Tools provides dynamic, real-time load balancing among call centers, reducing queue time and lowering service costs. · 4Cast®, a CRM product that automates intelligent customer interactions, predicts future behavior and conducts targeted messaging campaigns. · Intelligent IVR, featuring personalized, intelligent customer voice interactions. · Voice eSignature™, for legally binding voice biometric signatures. 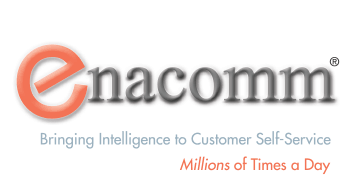 With sophisticated systems that reliably process spoken, data and touch-tone requests in real-time, Enacomm is bringing intelligence to customer self-service millions of times a day. Call Enacomm at 877.860.0025 and ask for Sales or visit us at www.enacomm.net.